Allan Pineda (born November 28, 1974) better known as apl.de.ap (pronounced "Apple Dee Ap"), is a Filipino-American rapper, record producer, and occasional drummer who is best known as a member of the Grammy Award-winning group The Black Eyed Peas. The Black Eyed Peas date back to 1988, when eighth-graders William Adams (will.i.am) and Allan Pineda (apl.de.ap) met and began rapping and performing together around Los Angeles. The pair signed to Ruthless Records (run by Eazy-E) in 1992, catching the attention of Eazy-E manager, Jerry Heller's, nephew. Along with another friend of theirs, Dante Santiago, they called their trio Atban Klann (ATBAN: A Tribe Beyond a Nation). 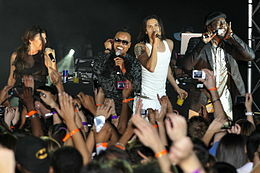 Will 1X (aka will.i.am), apl.de.ap, Mookie Mook, DJ Motiv8 (aka Monroe Walker) and Dante Santiago formed Atban Klann. Their debut album, Grass Roots, was never released because Ruthless founder Eazy-E had died. After Eazy-E died in 1995, Atban Klann reformed and changed their name to Black Eyed Pods, and then Black Eyed Peas. Dante Santiago was replaced with Jaime Gomez (Taboo), and Kim Hill became a steady background singer. Unlike many hip-hop acts, they chose to perform with a live band and adopted a musical and clothing style that differed wildly from the "Gangsta Rap" sounds of Los Angeles-based hip-hop acts at the time. After being signed to Interscope Records and releasing their debut, Behind the Front (1998) the group (and their accompanying live band) earned critical acclaim. One of the singles from the album was "Joints & Jam", and was featured on the Bulworth soundtrack. Their second album was Bridging the Gap (2000), which had the single "Request + Line" featuring Macy Gray. In 2003 Fergie became the fourth member of the group. They released their third album "Elephunk", with the hit singles "Where Is the Love?" and "Shut Up". Their next album Monkey Business, was a worldwide success, certified 4× Platinum in the U.S., and spawning two singles, "My Humps" and "Don't Phunk with My Heart".